North Atlantic Books, 9781556439698, 184pp. David Emerson is the director of yoga services at the Trauma Center (traumacenter.org). In 2003 he codesigned the Trauma Center Yoga Program that includes classes and teacher training programs. He lives in Cambridge, MA. Elizabeth Hopper, PhD, is a licensed clinical psychologist specializing in traumatic stress and works as the associate director of training at the Trauma Center. She lives in Somerville, MA. "In this landmark book the authors offer survivors a gentle, step-by-step mindful yoga that is tailored for their specific needs.… This well conceived book is a tremendous resource for therapists and yoga teachers. By engaging the wisdom of their bodies, it is a great companion and guide to those taking the journey of recovery from trauma to wholeness. Overcoming Trauma through Yoga is a gift for those taking the hero’s journey of recovery and vibrancy." "This book sets out to facilitate the creation of healing environments. Clinicians will learn basic yoga skills that can be implemented within individual therapy sessions. Yoga teachers will find thoughtful advice on how to make assists that won’t trigger internal defenses. And trauma survivors will receive edict-free encouragement for using yoga as a tool for self-discovery. Thoughtful and thorough, Overcoming Trauma through Yoga brings a spirit of optimism to the process of healing past wounds and reclaiming body and mind." "Trauma-related conditions are complex disorders involving dysregulation of the mind, body, and the mind/body interface. Although yoga is a mind/body practice known to have significant therapeutic benefits, yoga for healthy individuals is not the same as yoga therapy for patients, which must take patient limitations into account. 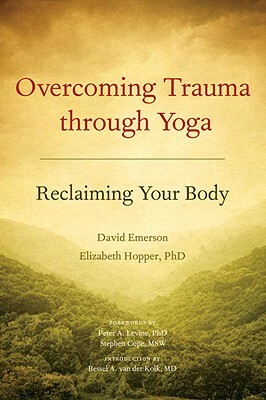 The trauma-sensitive yoga developed by the authors through practical and clinical experience, and described carefully, practically, and systematically in this book, incorporates the best that yoga has to offer with what will benefit trauma patients safely and comfortably."